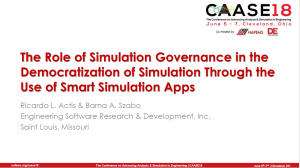 The Role of Simulation Governance in the Democratization of Simulation Through the Use of Smart Simulation Apps | ESRD | Engineering Software Research and Development, Inc.
Abstract: The standardization, automation, and democratization of new technologies such as Sim Apps through the adherence to the practice of Simulation Governance offers many benefits to industry at the engineering, product, and business levels. These benefits include encapsulating complexity, improving productivity, containing cost, and ensuring reliability for the expert simulation analyst and non-expert design engineer alike. Originally presented at the 2018 CAASE conference in Cleveland, OH.